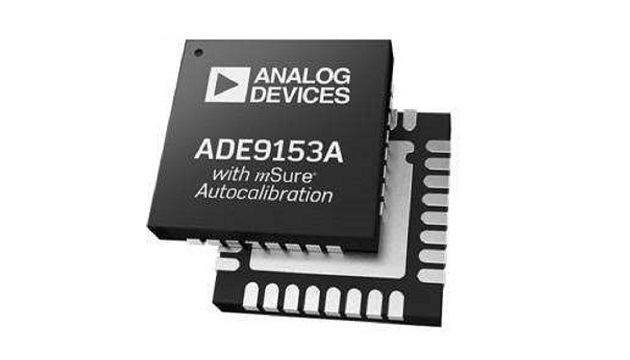 Outfitted with three ADCs providing an 88 dB SNR, the ADE9153A single-phase energy-metering IC from Analog Devices automatically calibrates current and voltage channels without a source or reference meter. The part enables designers of intelligent lighting, EV charging, and industrial equipment to add energy measurement with billing-grade accuracy to their products. 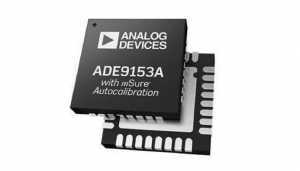 The ADE9153A supports active energy standards, including IEC 62053-21, IEC 62053-22, EN50470-3, OIML R46, and ANSI C12.20. Reactive energy standards IEC 62053-23 and IEC 62053-24 are also supported. The IC performs power-quality measurements such as zero-crossing detection, line-period calculation, angle measurement, dip and swell, peak and overcurrent detection, and power-factor measurements. Useful for shunts, the ADE9153A’s current channel A has a flexible gain stage and provides full-scale input ranges from 62.5 mV peak down to 26.04 mV peak. Current channel B offers gain stages of 1x, 2x, and 4x for use with current transformers. A 10-MHz SPI port allows access to the ADE9153A’s registers. Supplied in a 32-lead, 5×5×0.75-mm LFCSP, the ADE9153A costs $2.97 each in lots of 1000 units. An evaluation Arduino-compatible shield outfitted with the ADE9153A .